In 2011, NASA’s Dawn spacecraft established orbit around the large asteroid (aka. 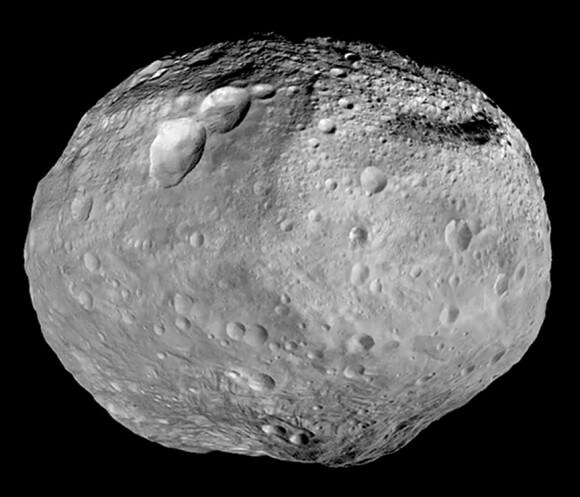 planetoid) known as Vesta. Over the course of the next 14 months, the probe conducted detailed studies of Vesta’s surface with its suite of scientific instruments. These findings revealed much about the planetoid’s history, its surface features, and its structure – which is believed to be differentiated, like the rocky planets. 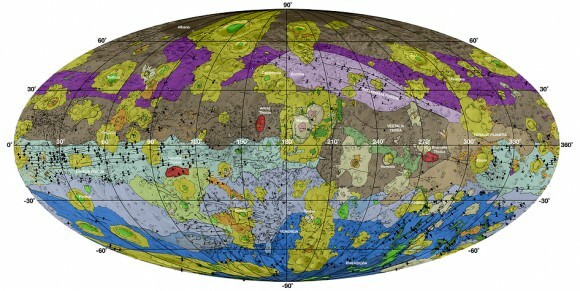 In addition, the probe collected vital information on Vesta’s ice content. After spending the past three years sifting through the probe’s data, a team of scientists has produced a new study that indicates the possibility of subsurface ice. These findings could have implications when it comes to our understanding of how Solar bodies formed and how water was historically transported throughout the Solar System. Their study, titled “Orbital Bistatic Radar Observations of Asteroid Vesta by the Dawn Mission“, was recently published in the scientific journal Nature Communications. Led by Elizabeth Palmer, a graduate student from Western Michigan University, the team relied on data obtained by the communications antenna aboard the Dawn spacecraft to conduct the first orbital bistatic radar (BSR) observation of Vesta. This antenna – the High-Gain telecommunications Antenna (HGA) – transmitted X-band radio waves during its orbit of Vesta to the Deep Space Network (DSN) antenna on Earth. During the majority of the mission, Dawn’s orbit was designed to ensure that the HGA was in the line of sight with ground stations on Earth. However, during occultations – when the probe passed behind Vesta for 5 to 33 minutes at a time – the probe was out of this line of sight. Nevertheless, the antenna was continuously transmitting telemetry data, which caused the HGA-transmitted radar waves to be reflected off of Vesta’s surface. This technique, known as bistatic radar (BSR) observations has been used in the past to study the surfaces of terrestrial bodies like Mercury, Venus, the Moon, Mars, Saturn’s moon Titan, and the comet 67P/CG. In the end, Palmer and her colleagues concluded that the presence of buried ice (past and/or present) on Vesta was responsible for parts of the surface being smoother than others. Basically, whenever an impact happened on the surface, it transferred a great deal of energy to the subsurface. If buried ice was present there, it would be melted by the impact event, flow to the surface along impact-generated fractures, and then freeze in place. Much in the same way that moon’s like Europa, Ganymede and Titania experience surface renewal because of the way cryovolcanism causes liquid water to reach the surface (where it refreezes), the presence of subsurface ice would cause parts of Vesta’ surface to be smoothed out over time. This would ultimately lead to the kinds of uneven terrain that Palmer and her colleagues witnessed. This theory is supported by the large concentrations of hydrogen that were detected over smoother terrains that measure hundreds of square kilometers. It is also consistent with geomorphological evidence obtained from the Dawn Framing Camera images, which showed signs of of transient water flow over Vesta’s surface. This study also contradicted some previously-held assumptions about Vesta. This work was sponsored by NASA’s Planetary Geology and Geophysics program, a JPL-based effort that focuses on fostering the research of terrestrial-like planets and major satellites in the Solar System. The work was also conducted with the assistance of the USC’s Viterbi School of Engineering as part of an ongoing effort to improve radar and microwave imaging to locate subsurface sources of water on planets and other bodies. If you want to get inside a planet or moon fast, the European Space Agency says lobbing a spacecraft at the surface might be a good approach. This concept may sound like suicide. A recent prototype test, however, shows the spacecraft structure is mostly okay. Next step is figuring out what can survive on the inside. ESA, like NASA and other agencies, isn’t afraid to test out new landing concepts if they suit better than the traditional ones (which use rockets and/or parachutes to land a spacecraft softly on the surface). Witness the Curiosity rover’s “seven minutes of terror” concept as a successful example. Imagine that you want to look at water below the surface of Mars, or (like the people in Europa Report) you wish to plumb into the ice of Jupiter’s moon, Europa. One option could be a drill. Another one could be a subsurface spacecraft. “One benefit over landers and rovers is that penetrators provide access to the subsurface without the need for additional drilling or digging,” ESA stated. To test this out, engineers put 12 solid-propellant boosters on to a 44-pound (20 kilogram) prototype and fired it at almost the speed of sound at sea level: 1,118 feet a second (341 meters/second). (More technical details on the test). The 1.5-second test, shown in the video, saw the prototype careening into 10 tonnes of ice at a deceleration of 24,000 times the force of gravity. Astronauts, by contrast, usually only withstand 3-4 g when going into space. The scuffed and dented spacecraft was retrieved successfully, and now ESA is reviewing how well the internal structure held up in the chaos. They also plan to develop battery and communications systems that could somehow survive intact. High-speed tests are not only useful for spacecraft landings, but also for meteor simulations. An article in Wired recently covered the progress of the NASA Ames Vertical Gun range in its nearly 50 years of operation. Check out how it’s studying meteor impacts on Mars in the Wired article.